So there is a chance, nothing definite mind you, that I will get to take a trip out to Yellowstone the last two weeks in September. Originally, I dreamed of a long trip covering the better part of three weeks or maybe even a month. Colorado, Wyoming, Yellowstone of course, Montana, maybe even the Green River in Utah, just me and the most wild places I could find, preferably places that were blessed with numbers of quality trout. The more thought that I've given to this possible trip, the more I realize that I mostly want to just visit Yellowstone. 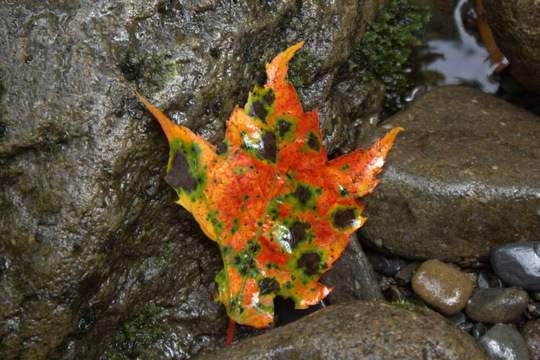 I've never had the good fortune to fish it in the fall but have long wanted to. Unfortunately, or perhaps fortunately, I'm never always quite certain, there is nothing to take me to Colorado other than the fishing and those rivers will be there for a long time still. In Yellowstone, however, while my favorite stream will be there for a long time to come (unless the super volcano blows that is) the very thing that makes it my favorite Yellowstone National Park stream is in danger of being destroyed. So far as I can tell, the Park has not yet implemented their ludicrous plan to remove the browns, brooks, and 'bows from the Gibbon River, but knowing how such things work, it is surely still in the works. While a good number of people seem to be in favor of the change, they clearly have little knowledge of both cutthroat and their habitat preferences (the meadows of the Gibbon get way too warm for cutts) and also very little knowledge of the gem of a stream that the Gibbon is as is. I'm okay with people not understanding this beautiful stream since it leaves the lunker browns for me and a few select others to hunt, hopefully in a few more weeks. 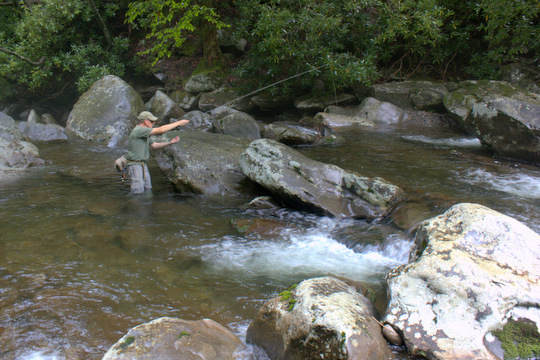 A trip across several states and nearly across the country just to fish one stream may sound a bit extreme, and that is where I was hoping for some advice. I'll spend an inordinate amount of time fishing the Gibbon but would like to do more while I'm in the area. 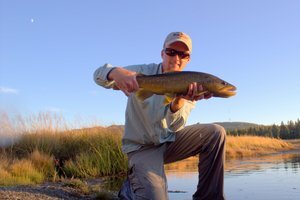 I've already fished Yellowstone National Park several times so need more info on how various waters fish during the last two weeks in September than anything. Will the Firehole be back in play yet? 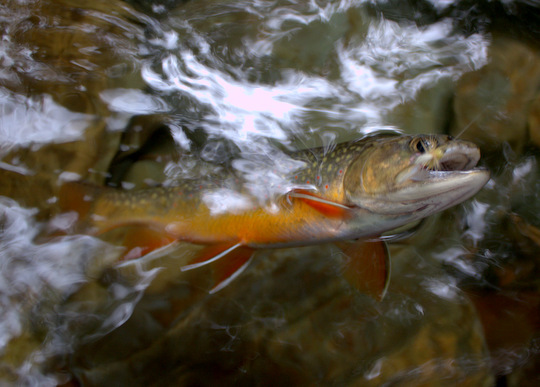 How about the lake run fish out of Hebgen on the Madison, lower Gibbon, and lower Firehole? How does the Madison outside of the Park fish at that time of year? Northeast corner of the Park such as Slough, Soda Butte, and the Lamar? How about the Yellowstone in the Grand Canyon or the Black Canyon? 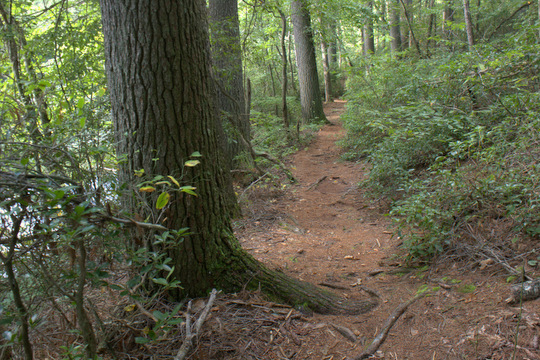 Backpacking that time of year would be pretty sweet, but since I'll be solo I doubt I'll tempt the bears too much. Day trips are risky enough by myself I suppose. I've never fished the Gardner. 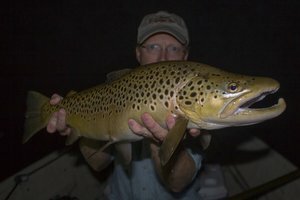 Would it be worth hitting for runner browns in late September or would I need to be out there later in the fall? Any and all advice would be appreciated. 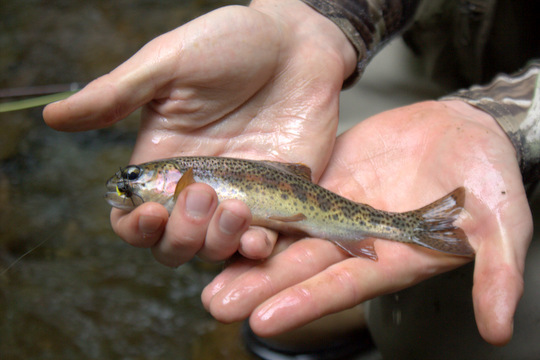 I prefer catching brown trout first, cutthroat second (I would be in Yellowstone after all), and any other trout are just nice bonuses. 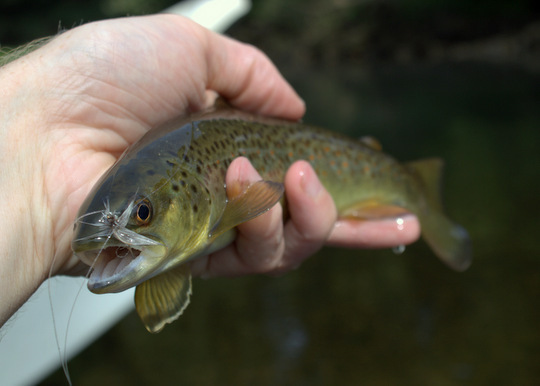 Since there seems to be a war on browns, and I know the cutts will be there in the future, I'm not as concerned with finding and catching cutthroat even though I'm sure I'll fish for them at least some. Finally, I fully recognize that fishing advice is rarely if ever best shared through the Interwebs for all to read. 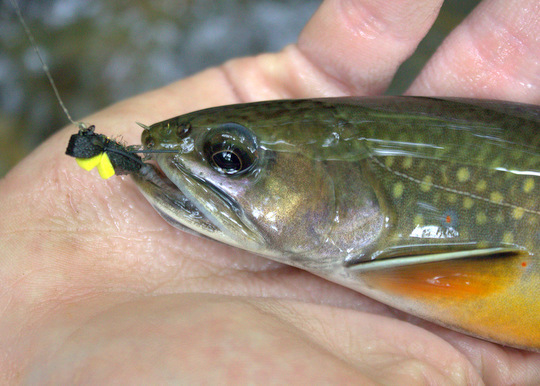 Feel free to email me at TroutZoneAnglers@gmail.com if you prefer that to answering on here. Thank you in advance for any and all advice! 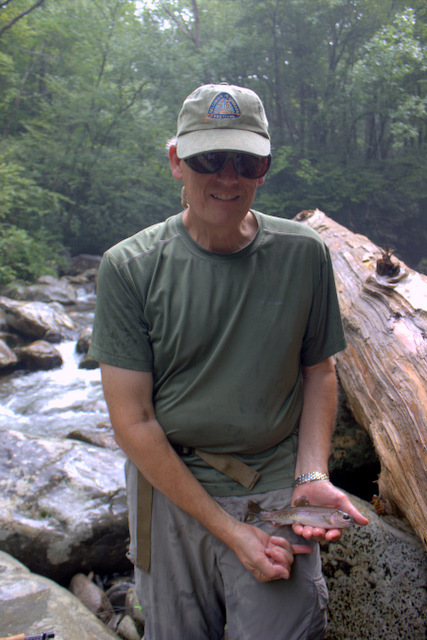 Over the last couple of weeks, I've spent time on both the Caney Fork tailwater and in the Great Smoky Mountains National Park. The fishing in the Park is anywhere from average to very good depending on where you are fishing. 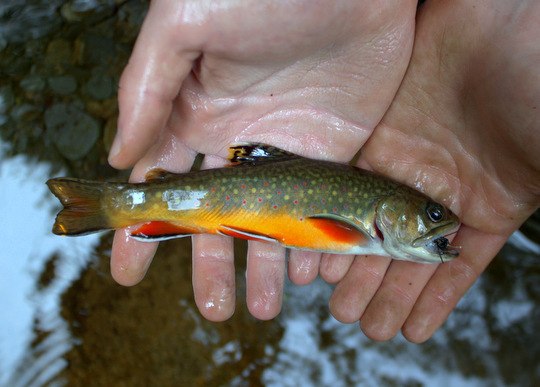 In fact, for those willing to put forth some effort to hike a ways, this time of year can produce some fantastic numbers of rainbow and brook trout on dry flies. 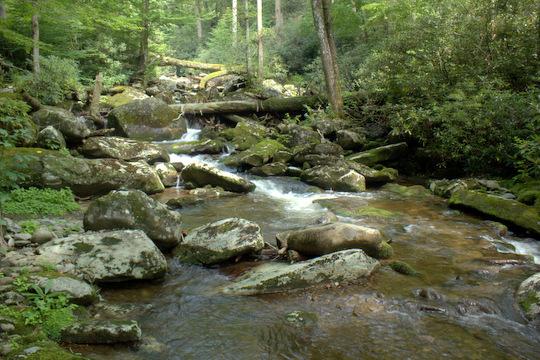 The roadside streams should be improving with the cool and cloudy weather this week. In fact, this weather is about the greatest thing we can get in the middle of August. 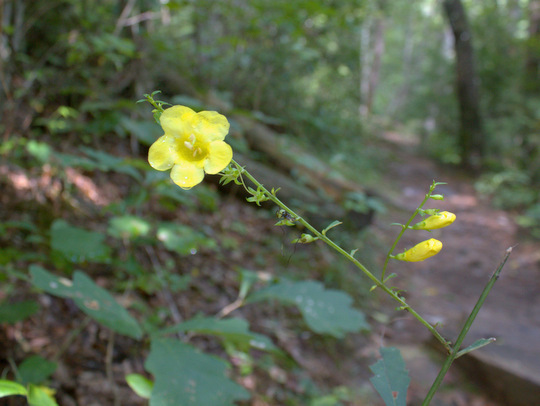 Hopefully September will bring cooler temperatures and maybe even an early fall. Last week, I had several trips. 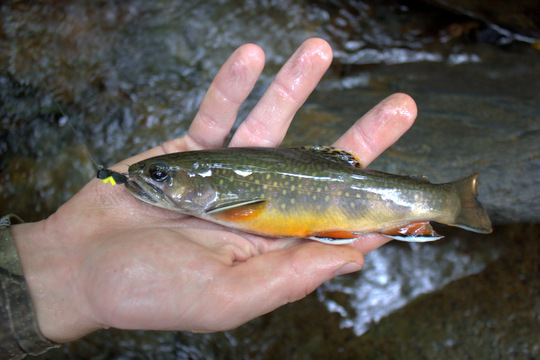 We had a good time on all trips but one had the added bonus of being on water that had brook trout. Here are a few shots from that trip with Charlie. Prospecting a nice pocket with the dry/dropper rig. Charlie with a nice rainbow trout. 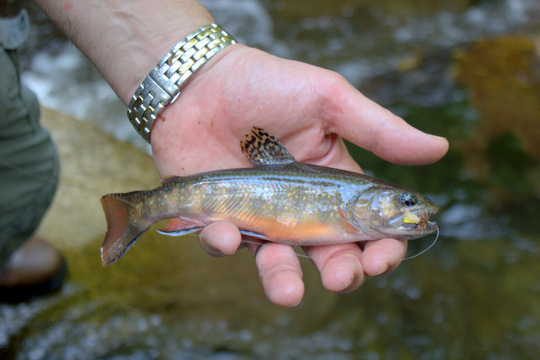 A Great Smoky Mountains brook trout. 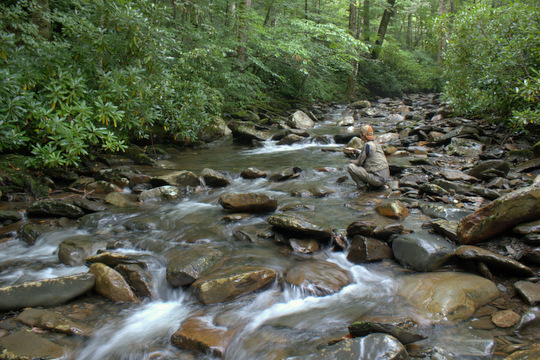 Remote brook trout water in the Great Smoky Mountains. Tomorrow it is back to work with a trip in the Park. Later in the week I have some days available as well as some time the following week. 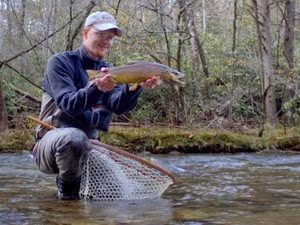 If you have been waiting for empty streams and willing trout, this is a great time to book a trip. Most of the summer vacationers are gone since school is back in session. If you want to have the water to yourself, this time of year is second only to the cold of winter for solitude if you go midweek. 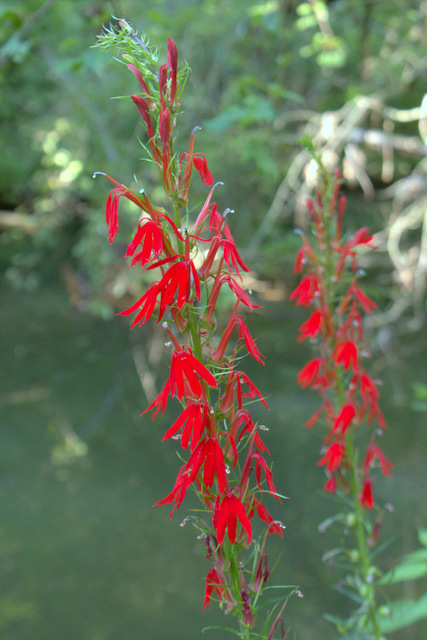 Despite staying fairly busy, I finally found the time to finish the August 2015 Trout Zone Anglers Newsletter. Check it out, and even better pass it on to your friends. Thank you for reading. If you wish to subscribe but have not yet done so, you can fill out the form below and you will be good to go. 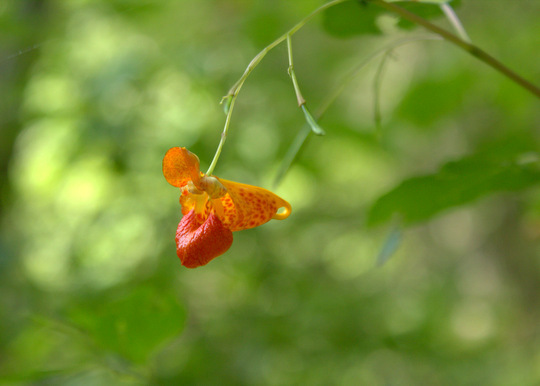 If you like what you see on the newsletter, then please sign up. I won't be using your email for any purpose other than for newsletters and occasional special guide trip offers and tips on great fishing when it is happening and will never sell your email to a third party. Wading a likely looking run on the Caney Fork River. 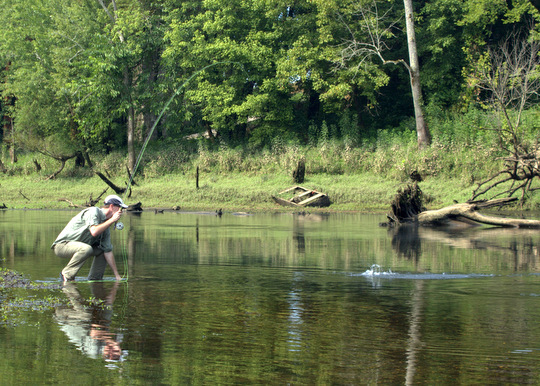 Floating on low water is usually the preferred method for fly fishing the Caney Fork River. 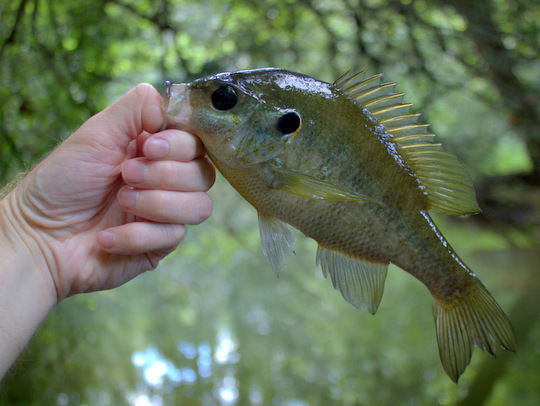 In addition to being much safer, the low water concentrates the fish and allows anglers opportunities to sight fish and also normally to catch good numbers. Last week, day two with Nathan and Frank was scheduled to be a low water float. We would have a hard time following up the big fish excitement of the previous day but hoped to find a few more trout. Then, in the afternoon, they had to take off, but I was going to do another section on high water again to see if the streamer bite was still on. We met early and were soon at the river dumping the drift boat and getting the shuttle taken care of. With everything ready to go, we soon pushed off and were floating downstream. Early on, we experimented with some patterns and tried a few different spots. A couple of fish hit but came unbuttoned quickly and we moved on to look for more willing candidates. Soon we were drifting over a favorite shoal that normally has a good number of trout. Sure enough, there were fish taking midges up and down the shallow gravel bar. I pulled the boat over and both Nathan and Frank jumped out to work the water more carefully. 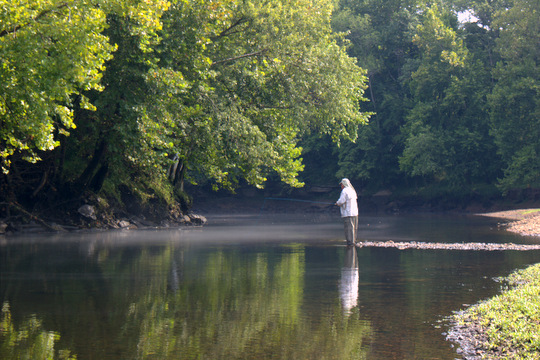 Caney Fork River fly fishing often entails sight fishing to steadily feeding trout and this day was no different. I grabbed my camera to record the fun. Frank working a good stretch right before hooking up with a feisty brown trout. 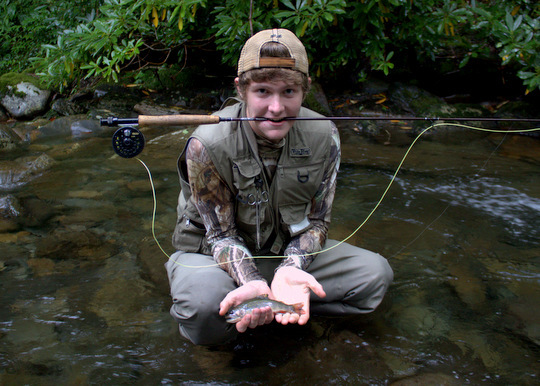 Nathan prepares to land a healthy rainbow trout caught on a midge pattern. 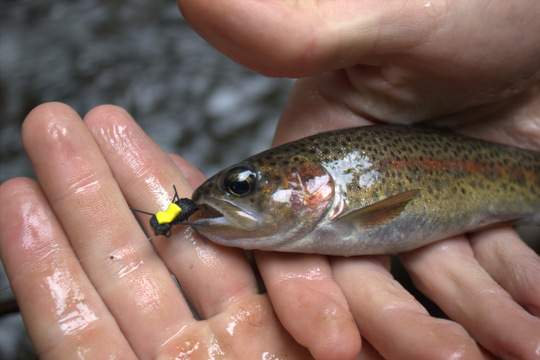 Frank had been wanting to find a fish willing to eat a dry fly. A friend of his had given him a handful of flies and he wanted to catch a fish on them and get a picture. That mission was soon accomplished. 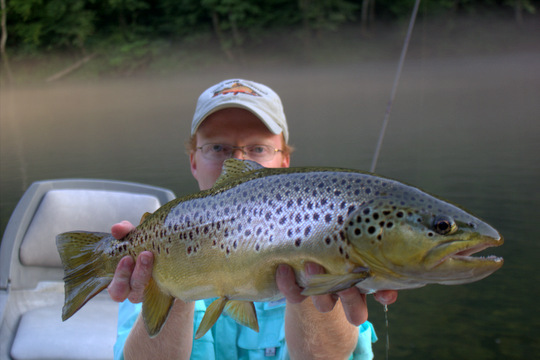 Caney Fork brown trout caught on a dry fly. 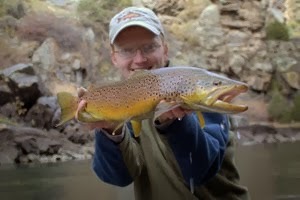 A happy angler with a Caney Fork brown trout. After the excitement, we were back in the boat and floating again. Some more fish were missed and then the action slowed. It became apparent we were following another boat so we passed them and rowed well downstream to not encroach on their water. Our time was running low but there were still a couple of big moments during the float. Nathan was the first to score. I had pointed to a spot and requested that the anglers drop their flies in a small section of moving water. Nathan used pinpoint accuracy to get the flies drifting exactly where they needed to be, threw a nice upstream mend, and then set the hook as the indicator dove under. 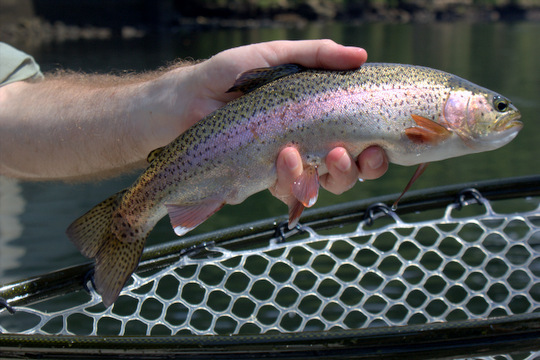 Soon the healthy holdover rainbow trout was in the net and we took a couple of quick photographs. Downstream a bit further, we had our last big moment for the day and it was really the highpoint of the whole float. 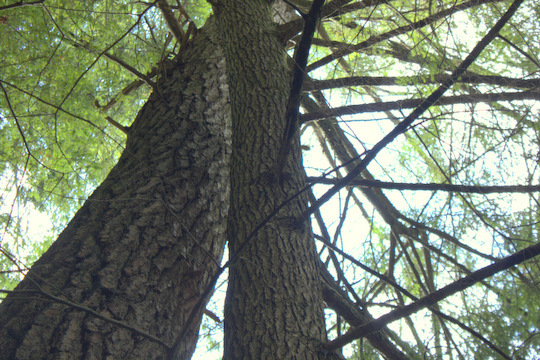 We were drifting down on another good spot, and I directed the anglers to place their flies right on the current seam. Almost immediately both indicators went down and the guys got good hooksets. Soon the net was filled with trout and we had two happy anglers on board the boat! One rainbow trout, one brown trout, and two happy anglers! Soon we arrived at the takeout and quickly hauled the boat out before the generation caught up with us. A good morning fly fishing the Caney Fork had been had by all. The guys had a long drive back to Georgia, and I needed a break to eat lunch and rest before the afternoon streamer float. More on that to come soon! 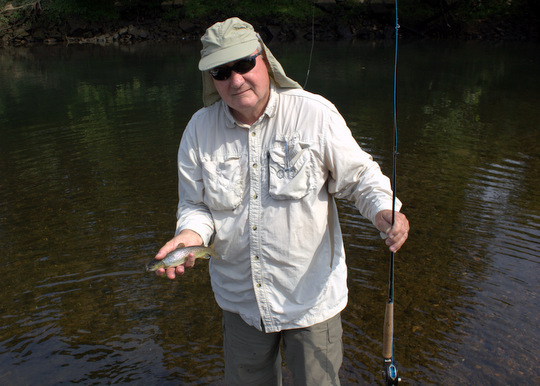 If I can help you with a guided fly fishing float trip on the Caney Fork River or a walk/wade trip in the Great Smoky Mountains National Park or on the Cumberland Plateau smallmouth bass streams, please call or text me at (931) 261-1884 or email me at TroutZoneAnglers@gmail.com. 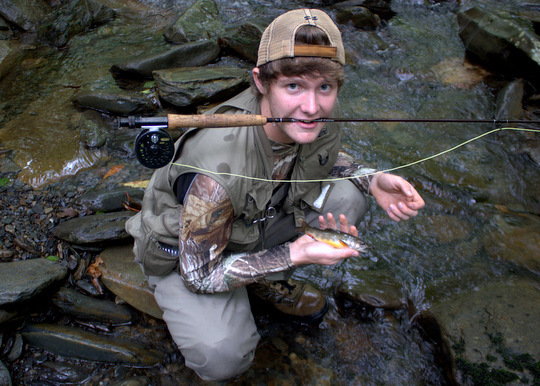 Nathan's 16" Caney Fork brown trout. Photo credit, Nathan Stanaway. Life rarely turns out as we planned. Jobs come and go and so do friendships unfortunately. Family is a bit more of a constant although even then we have no guarantees unfortunately. Many surprising twists and turns have come along for me through the years, some of which have been great while others are best forgotten. Earlier this week, a rather unusual change of plans was forced upon me that I did not particularly like, at least not initially. 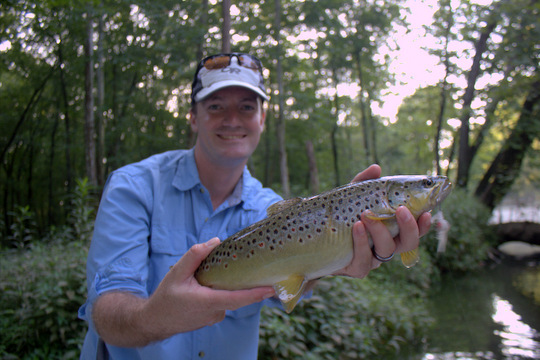 I never dreamed that it would lead to a great Caney Fork brown trout. This story, like most, needs some background information. 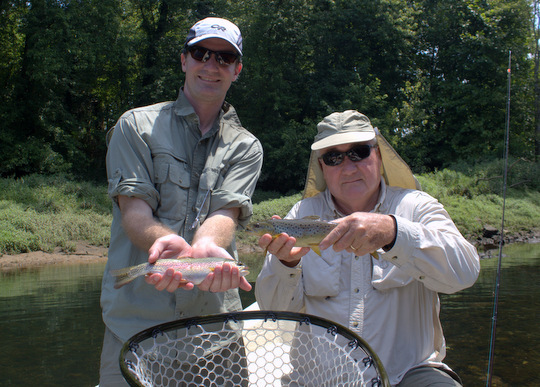 My cousin Nathan, who is one of my oldest and best fishing buddies, had made plans to bring his father-in-law Frank up to fish the Caney Fork with me for a couple of days. The trip was all about relaxing and having fun. 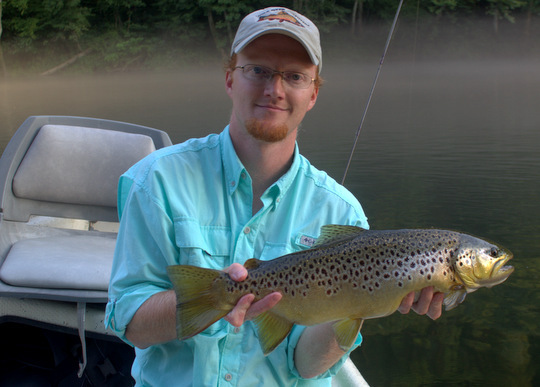 After last summer's fishing extravaganza that saw a fantastic Caney Fork brown trout caught on a hopper, Nathan was eager to get back out on the river. This time we wouldn't follow up the float with camping in the Smokies but would make the most of our time floating. For day one, generation was scheduled to start early so we planned on a late day trip to catch the falling water. Originally, when we checked the generation forecast on Sunday, the plan was to run from 9:00 a.m. until 3:00 p.m. That would be perfect to get out on the water and float down the river with just enough extra water in the river to keep us moving. We dumped the boat in around 2:30 p.m. to try and get downstream a bit before the water cut off and then leisurely drifted and messed around with some larger flies. By the time the generation was supposed to cut off, we were right where I wanted to be. The only problem was that the water just kept on coming. We continued to float and I tried some streamers which brought one Caney Fork brown trout to the boat and showed me some much larger fish. 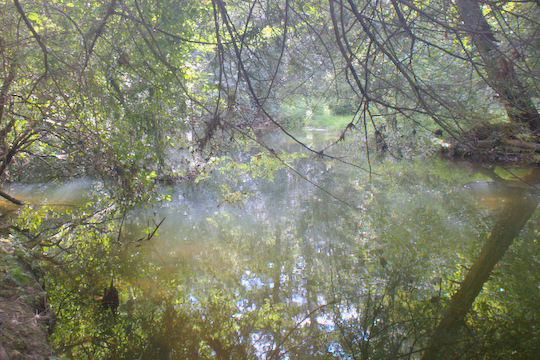 A bit further downstream, I finally made the decision to head for a bank and anchor up. Surely they would cut off the water soon. A quick check of the generation schedule told us that the cutoff time was pushed back to 4:00 p.m. Okay, no problem, we could wait a bit. You guessed it, four o'clock came and went with the water still rushing downstream. Finally, I apologized to the guys and said that we really needed to keep moving unfortunately. Streamers were strung up on the 5 weight Orvis Helios we had brought for dry fly and nymph presentations and we started drifting. After the second nice fish, a 16 inch brown trout, Nathan asked if I wanted to give it a shot. "Of course," was my answer. He had barely settled behind the oars when a large swirl appeared downstream and to our right. "Do you want me to row over there?" Again, I responded with "of course." On the very first cast, my fly had barely hit the water when a big chunk of golden brown was all over the fly and my 5 weight Helios was immediately being pushed harder than I had imagined would happen on this float. 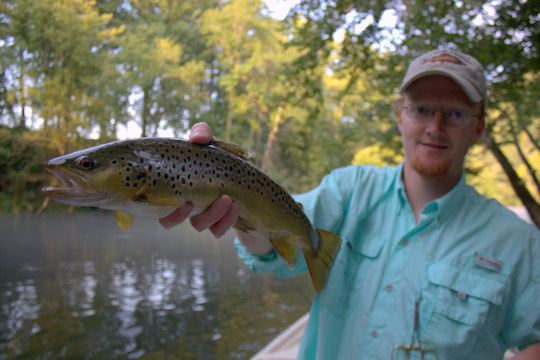 Before the stress levels got too high on the boat, Nathan slipped the net under the big Caney Fork brown trout, and I let out an ecstatic whoop that probably could be heard all the way downstream to the Cumberland. The fish stretched to 21 inches on the tape on the side of the boat and is an early candidate for my personal "Fish of the Year 2015." 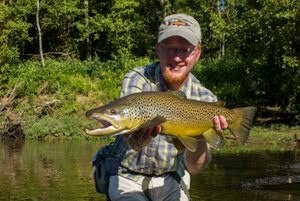 My big Caney Fork brown trout that ate a PB&J streamer. Photo credit, Nathan Stanaway. 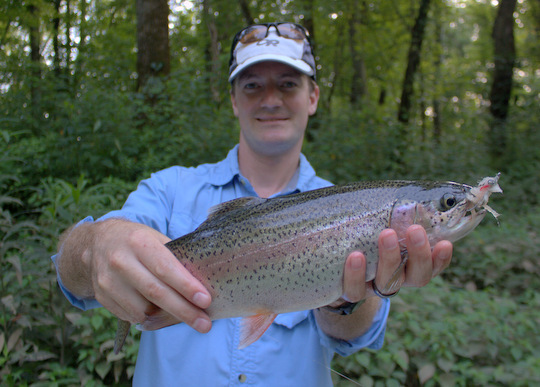 If I can help you with a guided Caney Fork float trip or a guided Smoky Mountain fly fishing trip, please contact me via call or text at (931) 261-1884 or email me at TroutZoneAnglers@gmail.com. I have some days open right now in the upcoming weeks so contact me soon about getting a chance at a big Caney Fork brown trout. 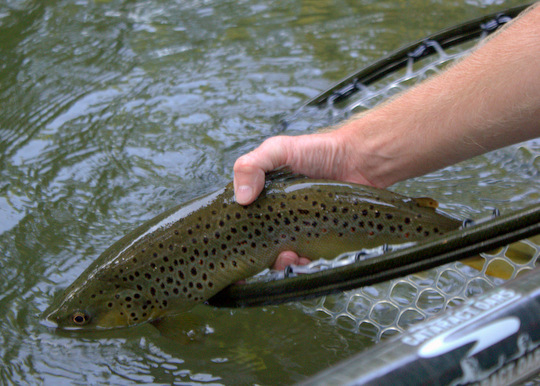 Releasing Nathan's fine Caney Fork brown trout. Photo credit, Nathan Stanaway.